VoIP Retail Traffic Providers | 8x8, Inc.
For most companies’ communication needs, a preference for VoIP technology is evident from the increased VoIP traffic and revenues being recorded by the VoIP market, with a significant improvement in the market share of several VoIP providers. To provide reliable retail communication services to your customers, the converged networks must have adequate bandwidth to support voice and other necessary applications. The networks should also be capable of delivering packet voice, or voice over packet, in real time. 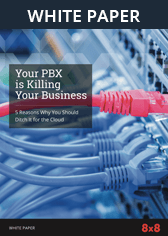 With packet voice, phone calls and faxes are routed over an existing data network instead of the traditional PTSN (public switched telephone network). But what exactly do these all mean for a retail call center? What Are VoIP Retail Traffic Providers? Retail VoIP is a business model where VoIP providers offer services to individual customers. These customers can be anyone placing long-distance calls or any-sized business with employees that rely on communication services for a number of uses, including internal collaboration. The second category is where retail call centers fall under. With VoIP retail, you get unlimited routing, switching, and reporting functionalities. You also get a system that allows you to effectively manage many users using a centralized web user interface. These combined features provide a powerful VoIP solution to retailers looking to optimize both their internal and external communication strategies. Plus, the transparency and accuracy of the billing system help ensure retailers are satisfied with the service. If your organization is looking to go beyond telco-based voice communications, you probably need to look for a business (VoIP) solution. However, if you choose a VoIP vendor, you will want to know if they offer a UCaaS or CCaaS package. VoIP is generally used for inbound and outbound calls. Retail communication software such as UCaaS look at the overall business communications and combine them over IP or Internet Protocol. Most VoIP solutions are single mode (i.e., inbound and outbound calls) while UCaaS is multimodal and includes several different communication tools, such as video conferencing, texting, screen sharing, group chat, and video meetings. It uses VoIP to power the voice part. Is VoIP or UCaaS the Perfect Choice for Your Company? Ultimately, the decision depends on your business, technology roadmap, communication needs, and long-term goals. For retailers with a few employees who do very little remote work but rely heavily on digital collaboration, VoIP solution may be the best choice for cost savings. On the other hand, for organizations with a strong need for employee mobility, multisite collaboration, and quick technological change, UCaaS is the way to go. If you’re still starting out and your communication needs are limited, hosted voice may be the perfect starting point for your organization. If you discover that you need additional collaboration tools, such as email, video conferencing, mobile messaging, and presence, consider unified communications technology or UCaaS. The beauty of cloud-based communication tools is that they’re highly scalable. Meaning, you can upgrade or downgrade your subscription as the need arises. Your company’s contact system is a critical element that portrays your ability to deliver quality service to your customers. Without a proper and high-quality voice system, you’ll be unable to resolve frequent complaints and meets your client’s expectations. Monitoring your retail store’s call center is key to ensuring your agents deliver quality calls, efficient customer service, and are available when needed. At the same time, the communication system should be cost-friendly and reduce the time and effort it takes for the user to get the help they need, thus increasing the prospects of growth for your business.